Sorry I have fallen off the ball on this. It is tough to think about blogging when you don't have access to a standard keyboard very much. Not that Jay wouldn't let me use the desktop, it has just been more convenient for me, for now, to just use the iPod. I am going to attempt to finish this off with this post, so hold on to your hats! 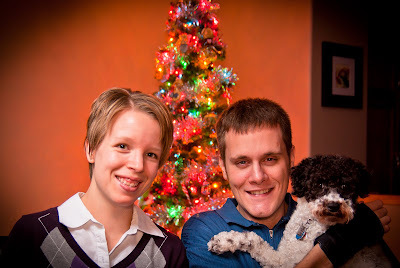 Here is the picture we took this year for our Christmas card. It's hard to get a dog to look at the camera when there is nothing interesting to look at. I think this was the only one where Kiwi was looking and Jay and I had decent looking expressions on our faces. Above is a picture of us with our dear dog Kiwi. She is such a little goof and makes us smile and laugh on a daily basis. I can't believe how fond we have grown of her, and I think it will be a sad day indeed when she leaves our family. But she is only three years old (as of December 7th) so we are hoping for another 10 or so years with her. Something that stresses me out are aggressive drivers. People who think it's their right to zoom up to the front of the line when there is a long line of traffic waiting in the other lane. I get stressed out when someone follows too close behind me. I have been known to let my foot off of the gas until I slow down enough that they get annoyed and just pass me. I would say that I have road rage, but sometimes I feel like I am tense when I get home from being on the roads. I would have to say that my first wish would be for my husband's body to be fully restored to his pre-injury state. Not that I don't love him just the way he is, but I know the frustration he feels on day to day basis with his physical limitations. I would love to alleviate that for him! I would wish to have an endless supply of money. Not that I think being rich would make me happy, I would love to be able to help others more. I would love to have the opportunity to fly off on a vacation to some exotic location without having to worry about how to pay for it. But I would also love to pay off my friends and family's mortgages. I would love to help ease others financial burdens. I would wish that I could eat whatever I want without gaining weight. After this holiday season of overindulging and not exercising, I am definitely feeling like I have lost some of the fitness that I gained last summer. I am posting this picture as an incentive to myself to get back to working out! This picture was taking after 90 days of doing P90X and since then my tummy has definitely gotten softer again. Not that it was rock hard, but it's getting squishier. I have the bloated feeling that I started to notice when I first went on my thyroid meds and I gained 15lbs in about 6 weeks. I haven't gained much in the way of weight, which is nice, but I know I have lost muscle and gained fat. Time to get back on the wagon! The 'plan' I have made for myself is to do another round of P90X in the new year, and hopefully by the time I finish that at the end of March it will be nice enough to start getting outside to do some running again. I am hoping to ultimately train to do a half marathon, but if that doesn't work out, maybe at least run a couple more 5 or 10k races to keep in shape. And that concludes my 30 day blog challenge. It may have taken a little longer than I hoped, but I hope you have enjoyed finding out a little more about me :) It has been just about seven years since I started this blog and I hope to carry on in 2011!